In contrast to their representation in mainstream media as objects who exist to serve us, the animals in this campaign show us that they are feeling individuals with the right not to be used as ingredients, commodities or tools. Many of the ads feature residents of Eden Farmed Animal Sanctuary, allowing the public a glimpse of non-human lives that have been rescued from animal use and are social, playful, meaningful, and purposeful. 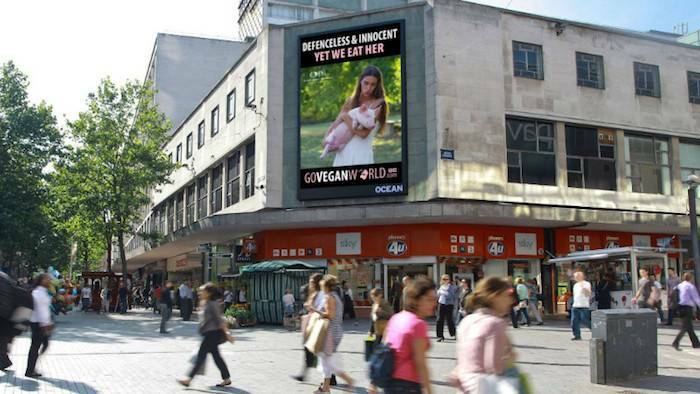 Go Vegan World launched in Birmingham in October. 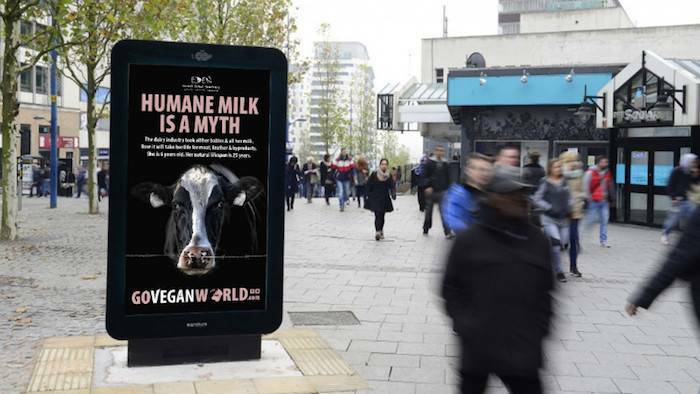 The largest vegan advertising campaign to date, it is estimated to be viewed over 50 million times. It is accompanied by a social media campaign targeting non-vegans which is estimated will be viewed 25 million times. A series of eye catching video and still ads featuring thought provoking messages will be displayed throughout Wolverhampton and Birmingham city centre, on the largest billboard in Europe on the M6, on taxis, in the Bullring Shopping Centre, and at the Plaza, New St. The message is a crystal clear, uncompromising call for complete and immediate cessation of all animal use. Veganism is presented in a simple, helpful manner that encourages people to view it through the lens of ease and benefit rather than hardship and deprivation. The campaign also launches in universities around the UK beginning with Birmingham City University and the University of Birmingham. The campaign team will be present in the University of Birmingham from 10 am on Thursday 27th October and at 18:00 Campaign Director Sandra Higgins will give a talk on veganism and animal rights. The campaign will have an educational gazebo and iAnimal virtual reality equipment on High St outside the Bullring Shopping Centre on Friday 28th October where the public can freely sample delicious vegan food from our campaign van. The campaign will be present for two days at the West Midlands Vegan Festival and Sandra Higgins will speak on both days at 12 noon. Please check the news section of the website for further details. All campaign resources are targeted at non-vegans. Please highlight the campaign to your non-vegan friends, family and colleagues. Encourage them to research the issues for themselves. Help them to go vegan. The campaign has already attracted some public attention from Vegan Food and Living and Vegan Magazine. We are looking forward to interest from the non-vegans at whom it is targeted. Through the generosity of its donors, this campaign offers a once in a lifetime opportunity for the animals to confront the public with their wishes for an end to the torment of being used by us. For the sake of non-humans everywhere, please support this campaign. Please share it on social media and in person with other vegans, and ask them to do likewise. It features several interrelated themes that aim to dispel the myths that enable our commodification of other sentient lives. In particular, the campaign challenges our ignorance of their sentience and equality, the deception of acceptable use, and the myth that any animal use is necessary. This campaign aims to reflect the truth of the consequences for them of our non-vegan lifestyle values and choices, casting a light into the hidden, dark world of human predation on defenceless others. It presents information to the public that counters socio-cultural acceptance of speciesism and offers veganism as a just alternative. May it bring us closer to animal equality and a vegan world.